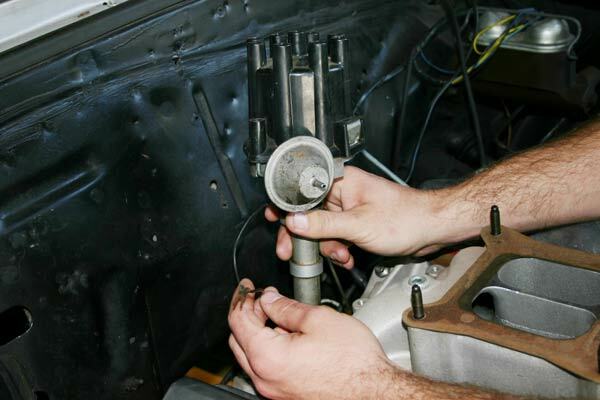 Tip: Label or mark the location of your spark plug wires on the distributor cap for fast, easy reference. Tip: When you have installed your HEI distributor, its best to widen the plug gap as well. Tip: You should run a new power wire that is getting a full 12 volts. Simply splicing into the existing lead is not getting maximum power to the ignition, as that is a resistance wire. If you measure the juice at idle on that wire, you will find it to be only around 9 volts. The car will run and operate using this wire under normal driving conditions, but the power loss will be noticeable at full throttle. 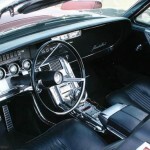 The vast majority of cars produced through the sixties and early seventies were all factory-equipped with a points type ignition. Although not likely to be considered the greatest manager of spark, at the time there was no other option. The HEI, which stands for High Energy Ignition, is a breaker-less, transistor- controlled, inductive discharge system. It operates in a similar fashion to the conventional points type ignition, but relies solely on a series of electronic signals to turn on and off the primary current rather than the mechanical opening and closing of points. 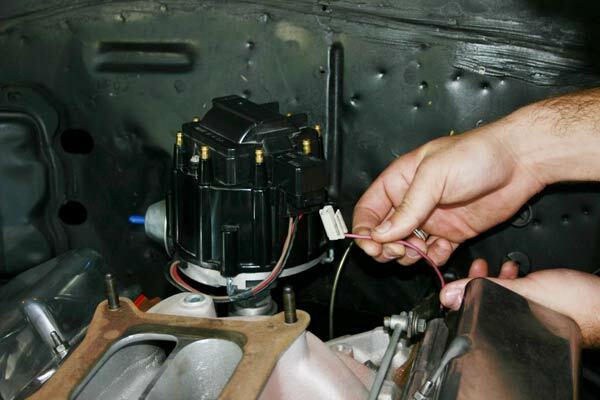 This task is routinely carried out by the switching transistor- located inside the ignition module. In fact, the HEI distributor is responsible for housing all of its components in one highly self-contained unit. In addition to the module, you will find the ignition coil, the pick-up coil, the magnetic pick-up assembly, and the mechanical and vacuum advance units– all nestled tightly under the cap. 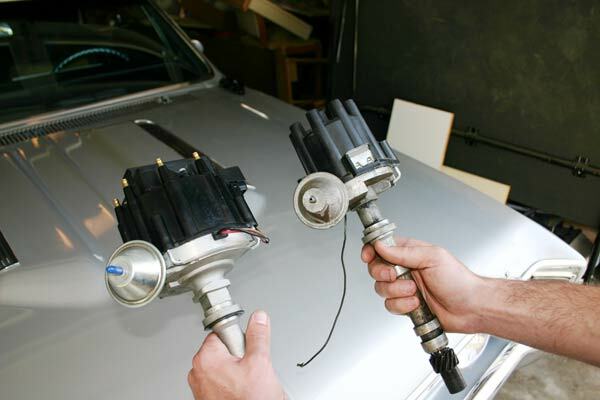 I would bet that anyone owning or driving one of these older, pre-HEI system equipped vehicles, at one time or another has run into problems with their stock ignition systems. Let’s face it; points are not our friends. No matter what you drive or the application, they always seem to be in a constant state of tune, looking for that elusive (if not imaginary), sweet spot. With so many other performance improvements that can be made on your car, who wants to spend their time adjusting the dwell angle? Sure, electronic ignitions such as the HEI are a little more expensive than the “rebuilt special” at your local parts store. 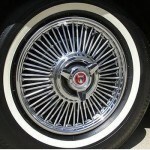 However, in the long run, the time and headaches you spare fiddling with your ignition will more than make up for the initial deficit of purchasing a new one. By simply switching over to an electronic distributor, not only do you eliminate the aforementioned hassles of points, but you will also notice a significant increase in your car’s overall performance. From crisper, off-idle throttle response to extra top end pulling power, the gains to be had by merely removing and replacing your stock distributor with a high performance HEI are downright impressive. And so, this brings us to the garage. Anytime you pull the distributor out of the motor, it’s important to make note of a couple key elements prior to removal. First off, detach the spark plug wires and the coil wire, and then remove the cap. Before loosening the distributor clamp and allowing the housing to rotate, mark the position of the housing as well as the vacuum advance unit and the rotor, all in relation to the engine block. Loosen the clamp and lightly lift up on the housing. After removing the ignition coil and leads as well as the plug wires, the distributor is now ready to come out. If the motor is undisturbed while the distributor is out, it’s simply a matter of reversal at this point to install the new HEI unit. Realign your markings and let it fall into place. DO NOT force it! The teeth of the gears must properly mesh together in order to fully reseat. 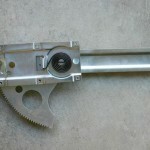 Once in position, hand-tighten the single bolt and clamp to allow for slight adjustability when re-starting the motor. On the other hand, if the motor has been moved, you will need to locate its TDC (top dead center). One easy way to do this without removing the valve covers is to pull the No. 1 spark plug. 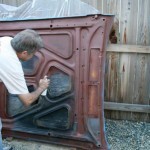 Place a finger over the hole and rotate the engine by hand until the compression is felt. When the timing mark on the crankshaft pulley matches up with the “0” on the timing tab, you have reached TDC. Now install the distributor with the rotor pointing at the No. 1 terminal on the cap. When reconnecting the new unit, you will need to purchase and splice in a single HEI terminal connector. This is your “hot” ignition wire coming from the engine harness. With the ignition coil neatly tucked inside the HEI, it makes the electrical hook-up a cinch. All you need to do here is splice the HEI connector into your existing “hot” ignition lead. For better performance, see Tips at beginning of this article. The connector then plugs into the cap at the “BATT” terminal. If you run an aftermarket tachometer, a second connector will be needed. It plugs in adjacent to the ignition lead at the “TACH” terminal. As I am sure you know by now, points type spark plug wires are not interchangeable with an HEI cap, and vice versa. What a night and day difference between the two! The HEI distributor actually houses the ignition coil underneath that massive cap. 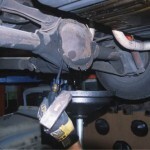 You will need to purchase a new set to match your new distributor. With that said, reattach your individual plug wires to their proper posts. Take your time and make sure you have them right. With everything finally back together, reconnect the negative battery cable and fire up the engine. Proceed to set the timing, and secure the hold down clamp. It’s a good idea to recheck the timing once more to ensure the housing did not move while tightening.